Iconic photo of Marina Ginestà i Coloma by Juan Guzmán on top of the Hotel Colón in Barcelona. 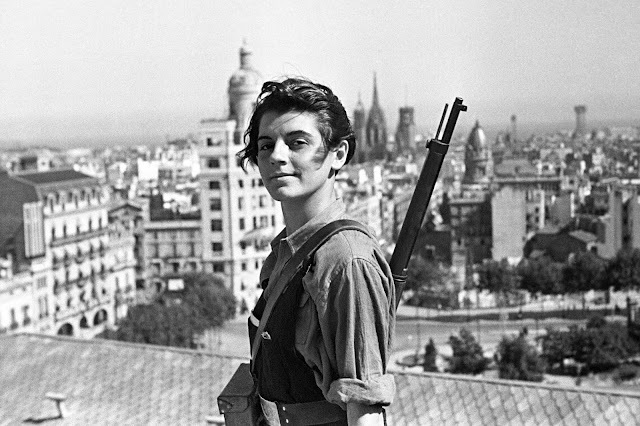 Marina Ginestà became famous due to the photo taken by Juan Guzmán on the rooftop of Hotel Colón, Barcelona during the July 1936 military uprising in Barcelona. As she was a reporter, it was the only time Ginestà was carrying a gun. The rifle she is carrying is M1916 Spanish Mauser, manufactured at famous Oviedo factory in Spain for the Spanish Army. Marina was a member of Juventudes Socialistas Unificadas (Socialist Youth), the youth organization mainly directed by Partido Comunista de España (PCE, Communist Party of Spain). As the war broke out, she served as a reporter and a translator assisting Mikhail Koltsov, a correspondent of the Soviet newspaper Pravda. Despite her initial involvement she quickly grew disillusioned with the path that the Stalinists were taking. Marina remained a militant throughout the rest of the war and was drawn to other groups at that time such as the anti-Stalinist P.O.U.M (which the famous writer George Orwell was a member of) and the Anarchist C.N.T. Before the end of the war, Ginestà was wounded and evacuated to Montpellier. Marina did not knew about the photo until 2006, although the iconic image was printed and circulated everywhere, serving as cover for the book “Thirteen Red Roses” by Carlos Fonseca, and was also along with dozens of other photographs in the book “Unpublished images of the Civil War” (2002). She was identified by Garcia Bilbao who read the memoirs of Soviet correspondent of Pravda Mikhail Koltsov, with whom the young girl appears in another photo. Garcia Bilbao found that Jinesta Marina, with J, which was identified by Guzman in the caption was actually Marina Ginesta, an exile who lived in Paris translating French texts. 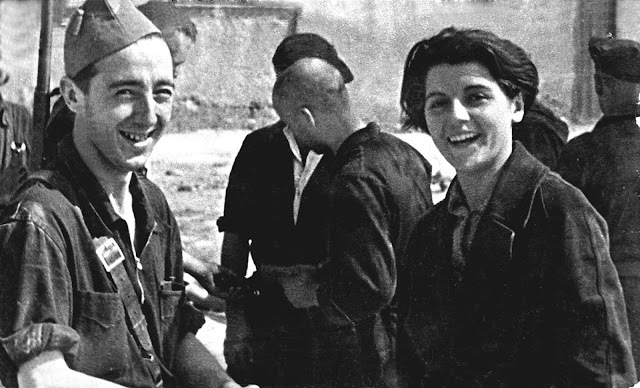 Marina Ginesta, the iconic girl of the Spanish Civil War, died January 6, 2014 in Paris, aged 94. Marina Ginesta and her brother, 1936.